* First is an easier pattern (for confident beginners and beyond). 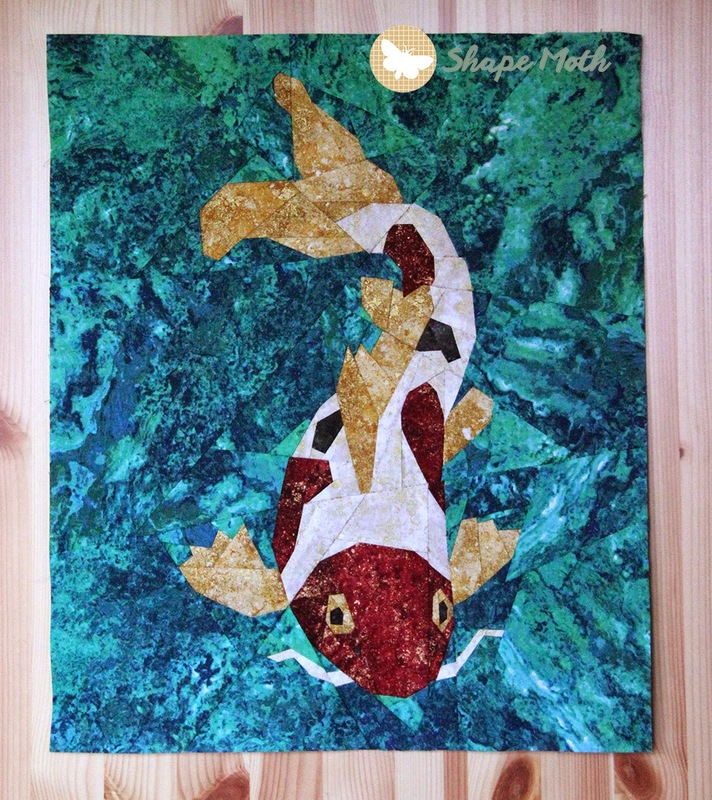 A 10" x 17" PP block which I once used to make this 'Koi pond' wallhanging (and since then several people were asking me about the pattern so it's finally time to prepare one). 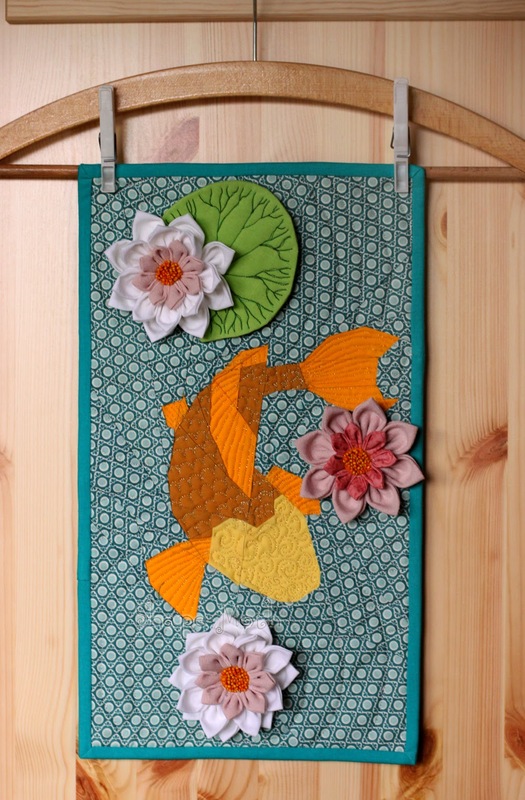 In adition to the pattern, you can use the free tutorial for the water lilies to make your own version of the wallhanging. You can find the tutorial HERE. Dzisiaj dwa wzory PP karpia koi. Pierwszy, latwiejszy, dla tych, ktorzy nie czuja sie ekspertami w szyciu PP. Blok ma wymiary 10" x 17" i niewiele czesci do zszycia razem. Moze niektorzy jeszcze pamietaja, jak kiedys uszylam makatke z karpiem koi i liliami. To wlasnie wzor do tego karpia, w tym samym rozmiarze. Jedyne, co trzeba dodac, zeby uszyc taka makatke, to lilie wodne z materialu, do ktorych tutorial jest TUTAJ. * Second pattern came to life when I finished the easier version. I decided that it's time to have an 'upgraded' version of the Koi. 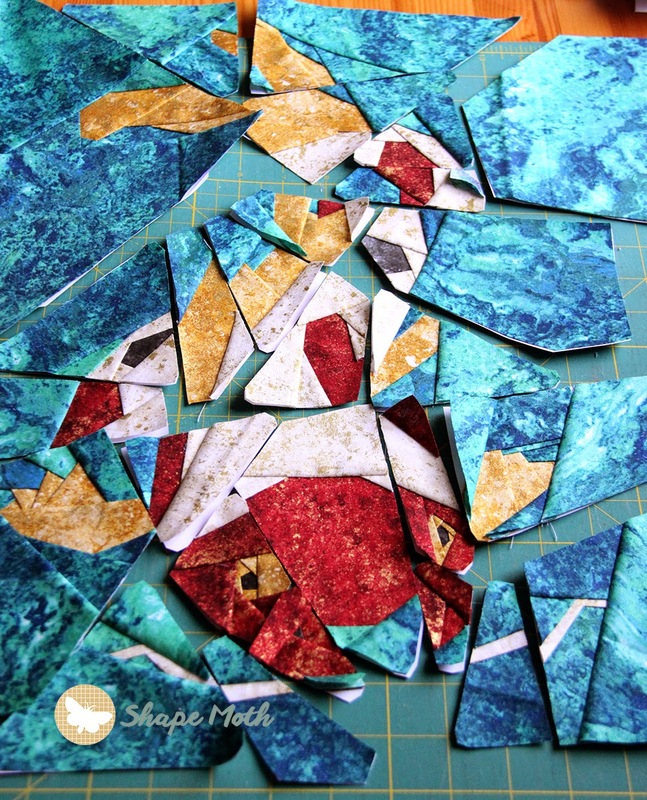 This pattern is for intermediates and advanced in paper piecing. Has lots of parts but is also bigger - 14" x 16". And traditionally - a giveaway! I will choose three random winners on Tuesday (and update this post with the results). Just let me know in the comment below this post, which pattern would you prefer to win - version for beginners or for intermediates/advanced? I na koniec, tradycyjnie, rozdawajka :) Jesli chcielibyscie wygrac jeden ze wzorow, napiszcie komentarz pod postem, ktora wersje wzoru byscie woleli - latwiejsza czy trudniejsza? We wtorek wylosuje 3 zwyciezcow (lista bedzie dodana do tego posta). Piękne! Ten drugi wzór wykonany z tych tkanin po prostu ZACHWYCA!!! Pięknie podkreślona woda i sam jest idealny! Dopiero po zestawieniu razem jak poszłaś do przodu i jak skomplikowane wzory PP teraz tworzysz. Nęcisz karpiem :). Gdybym miała szyć, chciałabym trudniejszy. Ale życia mi nie wystarczy na wszystkie szyciowe plany. 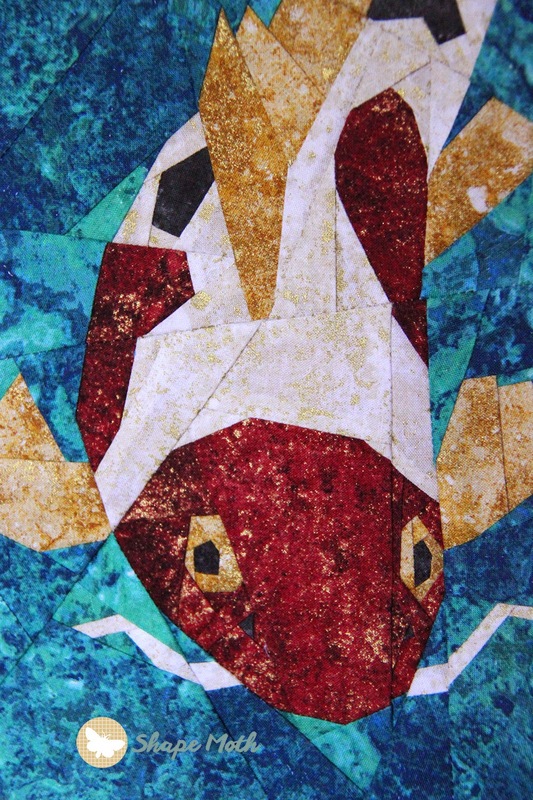 Your Koi pattern is really beautiful! I love the fabrics you have used as well. 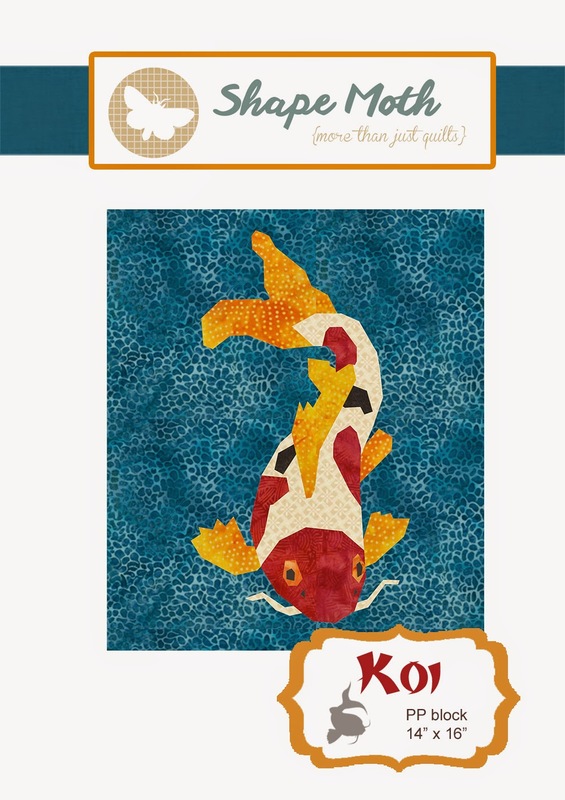 I think all of the koi patterns are fabulous! I especially like the advanced pattern wall hanging you did with the Stonehenge fabrics! I love both of the patterns!! I am not an advanced paper piecer though, so I would love the first one! We actually have some small koi fish! The wall hanging would make a perfect gift for my husband! Thank you!!!!! 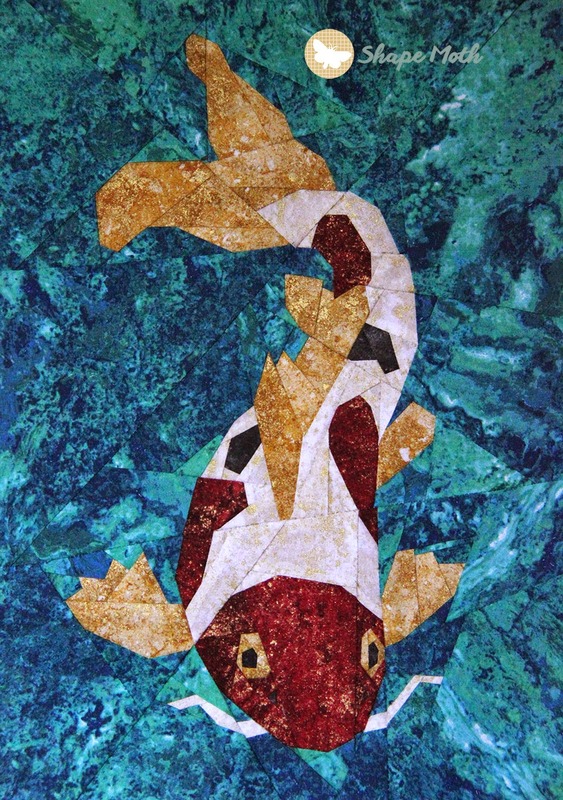 Ahhh, I have always LOVED your koi wallhanging! It makes me so happy that you've released it as a pattern! Should I be lucky enough to be one of the winning three, I would love the beginner pattern; I've only been paper piecing for a short while and the advanced looks daunting! This is beautiful. I've been watching this pattern since you first posted it. I was so excited when I got on today and saw you were offering it for sale. I also love that you made an advanced version, and I would LOVE to get my hands on it. Thank you for the continuous offers and happy paper piecing to all! 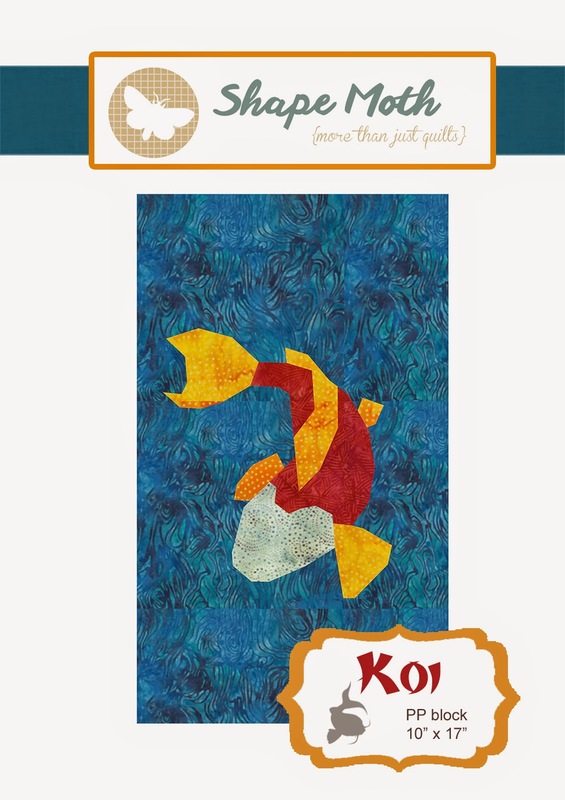 I love your Koi wall hanging, it's so pretty and reminds me of my childhood when our neighboring small town had a koi stream around the bandstand on the square. When we would make our weekly trip to it I would just spend the entire time watching the koi. If I am lucky enough to win I would love the advanced copy. Wonderful patterns! I love a challenge, so I would try the intermediate/advanced. Thanks for the fun! As much as I like the more difficult koi pattern I'm still a beginner so that is the one I would choose.. If I am lucky enough to win and find the easier fish easy to piece I can then try my hand at more detailed patterns.Thank you for making patterns that everyone can do! Beginner, please! I have added this to my wish list; I have a friend in mind for this lovely mini quilt. I would love the advance version. How beautiful to add the fabric florals to this! I'd love to try the beginner's pattern!! I'd like to give the beginner's pattern a go. Thanks for the chance to win! I'd love the beginners version ... As I'm more likely to finish it. Lovely waterlilies too. I would like the intermediates/advanced version if I win. I love all the Stonehenge colors and it was an excellent choice for this project. I have done a little paper piecing and am no way advanced enough to consider the advanced piecing. I would love to win the beginning paper piecing pattern. Both patterns are absolutely wonderful. Thank you for sharing and the opportunity to win a fantastic pattern. I'm up to the challenge for the chance to win the advanced pattern. Thanks for the chance. Wow! That's a lot of work to making that pattern! It's gorgeous. So pretty. I'd go for the challenge of the advanced. These are fabulous! I have so been enjoying paper piecing these days I would love to win the advanced version. Keep up the beautiful work! I absolutely LOVE ALL of your patterns! I am participating in your Sew Sweet QAL, and only just learned to PP this past summer! I'm trying to push myself to the limits and do the challenging projects, so if I were lucky enough to win one of your patterns, I'd love the intermediates/advanced one. Thank you for giving us all a chance at winning one of your amazing PP patterns! I am game for either one of your patterns...they are both beautiful. Thank you so much for sharing your wonderful paper piecing. Both are very pretty. I'm ready to try the more advanced one. Your patterns are beautiful. I'd love to win the advanced one. I'm addicted to paper piecing. Thanks for the great giveaway. I've done a fair amount of paper piecing and like most, it is truly addicting! I like both patterns, but favor the first one for it's simplicity. Both are beautiful. 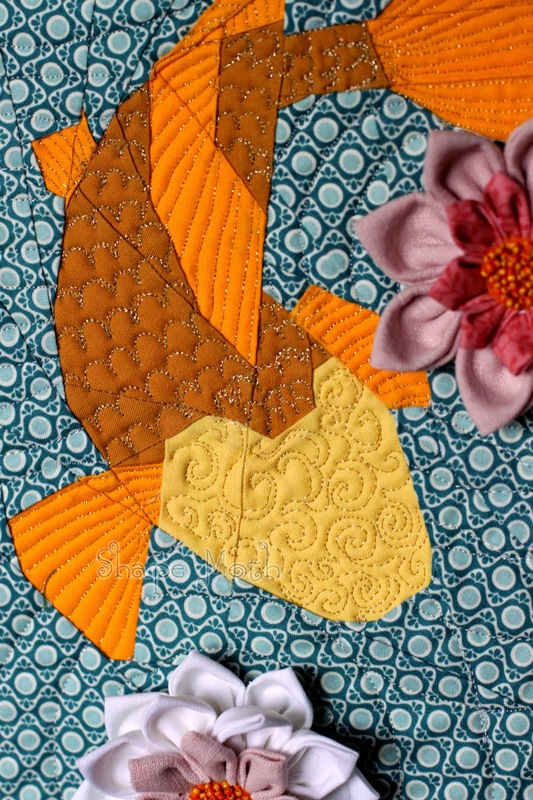 You Koi quilting is spectacular and those lilies are the perfect finishing touch. These are beautiful patterns ~ I'd love the advanced and the challenge! I knew a guy who had koi ~ they were huge and all had names. They liked to be petted! I like the simplicity of the first pattern, but I also like the detail of the face and the advanced pattern. At this point, I would choose the first pattern as I haven't been PP that long. Oba wzory sa cudowne! Wolę łatwiejszy, ponieważ dopiero rozpoczynam swoją przygodę z pp. Piekne wzory tworzysz, jestem wierną obserwatorką Twojego bloga! Pozdrawiam cieplutko. I found your website through the koi fish! I would love the simple version- i know i can't handle the complicated one.